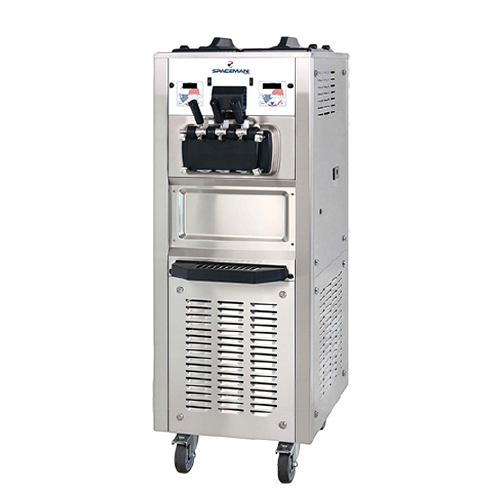 The Spaceman 6260HD – High Capacity, Energy Efficient, Twin Twist Floor Standing Soft Serve Machine is Ideal for Ice Cream, Custard, Frozen Yogurt, Gelato, and Sorbet! The Spaceman 6260HD is the premium soft serve option for high capacity businesses that want to offer more variety on their dessert menu. Dual controls allow the operator to independently manage settings for two different flavors, plus swirl in the middle, while the single 1-phase main compressor is energy efficient. Good for ice cream, frozen yogurt, gelato or sorbet, this model has convenient locking castor wheels and user-friendly digital control boards to adjust settings as needed. The hopper agitators will stir product throughout the day, saving operator time and ensuring an even cool in the hopper. Patented freezing technology on the 3.4qt cylinders means more ice cream is ready to serve at one time, producing up to 78qts/hr, or 620 small cones every hour. With the Spaceman 6260HD, Offer all popular soft serve variations from low or non-fat ice Cream to Custards, yogurt and sorbet. Separate hopper refrigeration maintains mix temperature below 4.40€ (40°F) during Cool and Standby modes. Hopper agitator keeps product mixed. When mix level is low, the Mix Low light turns “ON” to alert operator to add mix. Maintains product temperature in the mix hoppers and freezing Cylinders below 4.40€ (40°F) during long no-use periods. Automatically regulates refrigeration and maintains consistent product quality by controlling product temperature and viscosity. Records number of dispenses per day and total number of dispenses. Displays hopper and cylinder temperature; helps control product safety. Low temperature and motor overload Cutouts protect from Cylinder over freezing. High pressure switch prevents Compressor overheat. Thermal overload protects from motor overheat.